Every year sees its share of dazzling new fish species, and the frontrunner for 2018 has to be this stunning new anthiadine, thus far known only from a very remote corner of the Atlantic. 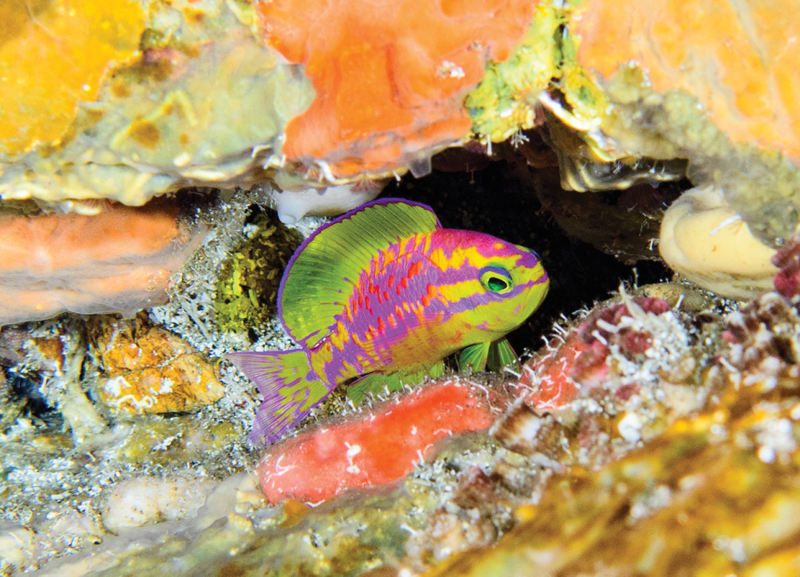 Researchers from the California Academy of Sciences discovered this pink and yellow beauty last year at St. Paul’s Rocks, a lonely speck of land situated roughly in the middle of nowhere, 600 or so miles offshore of Brazil. These barren islets house a fascinating marine fauna, famous for its aberrant (see: inbred) Queen Angelfish and a handful of interesting endemics, like the Oblique Butterflyfish (Chaetodon obliquus) and the little-known Salmon-spotted Jewelfish (Choranthias salmopunctatus). 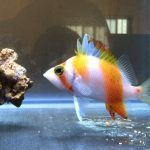 Add to that list Tosanoides aphrodites, the Aphrodite Anthias. The name is fitting, and I’ll go ahead and quote from the paper on its origins. As its discoverers, Hudson Pinheiro and Luiz Rocha describe it, “While we were collecting the Aphrodite anthias, a large Six-gill shark (Hexanchus griseus) came very close to both of us, but that didn’t divert our attention from the new exquisitely beautiful species, and we never even saw the shark. 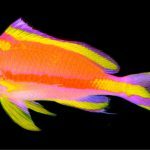 The beauty of the Aphrodite anthias enchanted us during its discovery much like Aphrodite’s beauty enchanted ancient Greek gods.” But aside from the ridiculous 80’s-themed color palette of this fish, there’s another reason to get excited for this new species. Tosanoides is a small genus, which has until now had just three described taxa (and a fourth soon to be described from Micronesia), but these are all restricted to the Pacific Ocean. 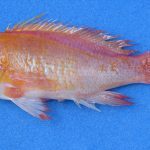 Aquarium specimens for any of these are few and far between (at least, outside of Japan), but the group made headlines not long ago when another recent discovery, Tosanoides obama, was named after President Barack Obama. Tosanoides aphrodite, male. Maximum size recorded for this species is 86mm. But finding a member of this group roaming around in the Atlantic raises some interesting questions. 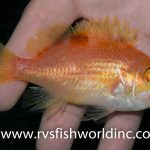 There are enough differences in its morphology to suggest that this might be a somewhat distant cousin of its Pacific relatives, but the available genetic data (based on CO1, the “DNA barcode”) paints a different picture, with T. aphrodite falling somewhere in the middle of this anthias family tree. This also raises the very distinct possibility that there are more Tosanoides out there to be discovered, like, say, in the Indian Ocean. 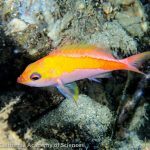 It’s surprising in general that a colorful new anthias like this would be found at all, as the Western Atlantic has tended to be quite well-explored, even at the rariphotic depths where this species was encountered (100-130 meters). Why are there no Tosanoides in the Caribbean then? We can perhaps look to the biogeography here to hypothesize an explanation, as the currents in the region seem to sweep species from the tip of South Africa towards the Central Atlantic. A prime example of this are the Xiphypops angelfishes, which likely colonized the Atlantic from the Indian Ocean in precisely this way. Perhaps this new Tosanoides is in the earliest stages of this speciation… perhaps it hasn’t managed to progress northwards beyond the natural boundary formed by the Amazon River’s outlet… or maybe it really does exist outside of St. Paul’s Rocks, and it’s simply yet to be discovered. Tosanoides is as beautiful and mysterious as they come, illustrating just how much is left to be discovered in the ocean’s deep reefs.